Eraser seems to have the same problem. Thursday, October 03, 2013 7:31:46 PM	Error	The program does not have the required permissions to erase the unused space on disk. Run the program as an administrator and retry the operation. Something has changed with my computer. 3. Right Click to Run as Administrator, accept the UAC warning to Allow the Program. 4. Click on the Step 4 tab. Please Create a Restore Point and Backup the Registry. 5. Make sure all of the items are checked like the image below and in the lower right corner tick Restart system when finished. Then click the Start button. I think I might have stumbled on upon something. Originally my computer was setup as 1 account (excuse me if these aren't the correct terms). At some point I added an Admin user (Rich) so I had two accounts/users Rich and Guest. When I turn on my computer I have to decide whether I am Rich or Guest user. If I "choose" Guest and run Eraser as Admin it works. If I choose Rich and run as Admin (or not as Admin) it doesn't work. Does it make sense to delete one of these? There is no difference as far as software or privileges between the two. Maybe there is a simple solution. I'll wait to hear your ideas before before I run Windows All-In-One. I think I stumbled on to more problems. When I chose the "Guest" account I took a look at my drives and what do you think I found? My C drive has 21.2 GB free space out of 681 GB!!!! My D drive (Recovery) has 2.05 GB free space out of 16.6GB!!! So, of course, I thought I better check the "Rich" account. What I found was mystifying. The C drive has 633 GB of free space out of 681GB!!! The D drive has 2.05 GB of free space out of 16.6GB. I hope you can help!! After Windows Repair All-In-One run, and the reboot, check and see if Rich's account is good ~ Run something you could not before. Then check the guest account and see if it's reading the drive space ok. Call it Test. Give it admin priviliges. Go to start page in that account. Reboot and log back into that account. Check if the Test account sees the drive correctly. Check if the Test account can run the tools. but I did find what is below. Is that what I should click on? - Windows Repair 1.9.18 is what you're downloading, when you click the button it asks if you want to download tweaking.com_windows_repair_aio_setup.exe. Click the little arrow to the right of the Save button, and you can direct it to your Desktop. Then follow previous instructions in post #62. And you are not taking too much of my time, don't worry about it! If you have any problems, or have any questions just ask. Both accounts read the drive space ok - 632GB free space on both accounts. 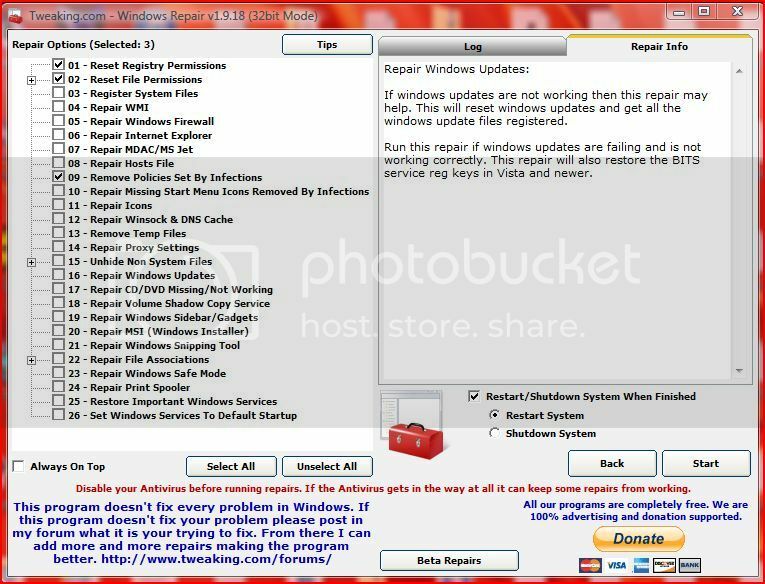 However, Rich account cannot run CCleaner or Eraser, same as prior to running Windows Repair All-In-One. Edited by 1324, 07 October 2013 - 06:13 PM. Thank you for that information This confirms the user account is indeed corrupted. Directions to address that to follow. 1. Log in to Windows with your administrator account or your Guest account that has administrator privileges. 2. Click the Windows logo button on the keyboard or the Start Orb. ~> Click Control Panel. a. If you're in Category view, click User Accounts and Family Safety ~> then click Add or remove user accounts ~> click Continue on the UAC warning. The Manage Accounts window will open. b. If you're in Classic View, click User Accounts. When the User Accounts window opens, click on Manage another account, click Continue on the UAC warning. The Manage Accounts window will open. 4. Below the box with all accounts listed, Click Create a new account. 5. Type Test as the name for the new user account. Select the account type ~> Administrator. Click Create Account. Log in, allow the Desktop to be created. Log out. 6. Repeat the steps above to create another user account. This will be your new user account so give it a name you want to keep. Log in, allow the Desktop to be created. Log out. 1. Log in to Windows with the Test user account. 3. In Classic View find and click on Folder Options. Click the View tab. Note: If you are in the Category view[, click Appearance and Personalization, a new window will open. Click on Folder Options. When the Folder Options window opens, click the View tab. 5. Click the Windows logo button on the keyboard or the Start Orb. Click on Computer ~> double-click the primary drive of your computer (usually the "C:" drive). 7. Double-click the corrupted Windows user's folder, (this would be the C:\Users\Rich folder) to show its contents in the right side of the window. 8. Click the first file or folder listed at the top of the list in the corrupted user's folder. Press and hold the Shift keyboard key. Scroll to the bottom of the corrupted user's folder. Click the last file or folder in the list to simultaneously select it and all the rest of the files. Release the Shift key. All will be highlighted. 9. Press and hold the CTRL keyboard key. Click on the Ntuser.dat, Ntuser.ini and Ntuser.dat.log files to deselect them. • NOTE: There may be more than one Ntuser.dat.log file. Deselect them all. 10. Release the CTRL button. Right-click on a selected and highlighted file and click Copy. This will copy all of the files. • NOTE: When you get the warning asking if you want to overwrite the file or folder, check the box to allow all files/folders to be overwritten. 13. Log off of the Windows Test account. 14. Log onto Windows using the new user account you just created. 15. Open the Control Panel and under User Accounts and Family Safety click Add or remove user accounts. 16. Click the Test account and click Delete the account from the list on the left. After you have confirmed that everything works OK in the new user account you can go back to the Control Panel and delete the old Rich account. Ok = all your Documents, photos, etc are there. The Ntuser.dat files are left. Those are the only files that are not copied over. If you're not seeing any, that could be the cause of the issue with the Rich account ~ why it does not behave properly. Watch how new fresh ones appear when you make the new account. Would that be the answer you're looking for? I must be missing something. I'm not sure what the corrupted files look like. I'll try again later this weekend. Don't worry about corrupted files. You're highlighting and copying over personal files. That's all Leaving the corrupt behind, or if you're not finding the ntuser.dat files, that's the corruption. When you copy the personal files over, fresh ntuser.dat files form. Then all should be good. Does that help? Is there something I can help with? "Click on the Ntuser.dat, Ntuser.ini and Ntuser.dat.log files to deselect them." Am I supposed to deselect them all? Yes Deselect them all, take no Ntuser files.